Here are the write ups! Does your eye choice resonate with you? What eye(s) are you? It's just for fun and I wanna see your answers! It's fun seeing who everyone is drawn to! If you are drawn to 1, Deep Down You Are Open. You're the type of person who will welcome almost anyone into your life and heart. You believe that it's better to take a risk and get hurt than to close yourself off to the world. You don't show the world your fears or insecurities. You believe that your problems should be dealt with privately. You try to be totally there for everyone, even if you're hurting inside. Helping others is how you heal. If you chose eye 2, Deep down you are Conscientious. You're the type of person who's always looking to make a good impression and do the right thing. You believe your actions make a difference in other people's lives, no matter how large or small they are. You don't show the world how worried and upset you are. You see a lot of misery and injustice that you keep to yourself. You are devoted to being the best person possible. It's the least you can do with your time on this planet. If you chose eye 3, Deep Down you are tortured. You're the type of person who has a very tumultuous past that still affects you today. You can't help but think that life is some sort of sick cosmic joke. You try to find your peace wherever you can. You don't show the world your darkest thoughts. You have a lot to endure, and your keeping it to yourself. Your outlook can be surprisingly sunny at times. You're an expert at picking yourself up when you fall. If you chose eye 4, Deep Down you are philosophical. You're the type of person who's likely to over think everything and anything. You like to get to the deeper meaning of things. You get so lost in your thoughts that it's sometimes hard to tell up from down. You don't show the world how unsure you are about everything. You may be figuring things out, but you're still confident. You see life as a puzzle, and you like playing with the pieces until they fit together. You may not ever figure out the meaning of it all, and you're okay with that. If you chose eye 5, Deep down you are mysterious. You're the type of person who hasn't figured yourself out, so good luck to anyone else who plans to try! You are a mash up of many contradictions, and your mood changes daily. Once find yourself, you've changed into someone else. You don't show the world much about yourself. You are a person of few words and confusing actions. You prefer to observe and learn about people before you chime in. You only say things that you are sure of. If you chose eye 6, Deep down you are sensitive. You're the type of person who notices everything and forgets nothing. You are very in tune with the world. You feel deeply, and sometimes the silliest things can affect you. You are easily brought to laughter or tears. You don't show the world how fragile you are. You instead show people how insightful you can be. You are good at anticipating what's going to happen in your life. You are often the first one to see what's coming. If you chose Eye 7, Deep down you are fiery. You're the type of person who's always energetic or passionate. There's nothing subtle about you… ever. You tend to love or hate everything. You have a ton of opinions, and you make up your mind quickly. You don't show the world how anxious you are. You have a lot of energy, and too much of it means you can be quite nervous. Everything is very high stakes for you. You can’t help but build up the drama in your head. 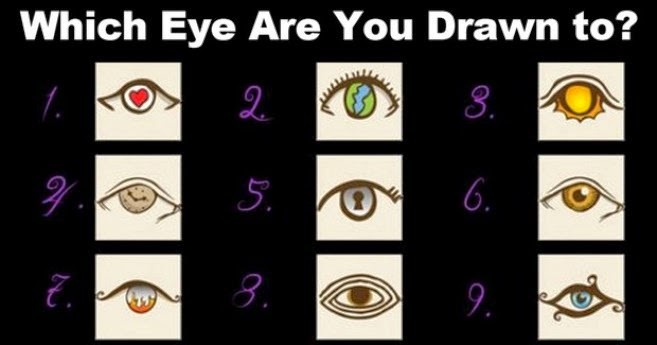 If you chose Eye 8, Deep down you are eccentric. You're the type of person who has unusual interests, beliefs, and practices. You've always been a bit of a weirdo. You don't care much for rules or tradition. You do things your way and let the chips fall where they may. You show the world everything about you. You have nothing to hide, and you just laugh off those who judge you. You wish everyone was more like you. There's a lot of joy in being a non-conformist. If you chose eye 9, Deep Down you are Intuitive. You're the type of person who understands other people and the world very well. You don't let on to how much you know. You can tell so much from someone's facial expressions or tone of voice. And you always know when you're being lied to. You show the world exactly what you want to show. Besides being good at reading people, you also know how you're being read. You know when you're being manipulated, and you know how to manipulate someone if you have to. You usually don't resort to it though!